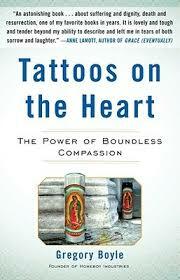 For February we read “Tattoos on the Heart: The Power of Boundless Compassion” by Father Gregory Boyle. This book was universally loved by all who read it. We were immediately interested in the stories, loved his writing style, and moved by Father Boyle’s mission in life. This book was a rollercoaster of quite tears, laughing out loud, and breaking out in goose bumps. One think he brought to the forefront for many of us was the little things in life that we all take for granted, and how different our view of the world could be if we had a different situations. One example illustrating this is the story of Father Boyle and two “homies” going to Coco’s restaurant, a first restaurant experience for the homies. It is difficult to contemplate reaching adulthood and never eating at a restaurant that has menus and a waitperson. Conversely, in the neighborhood and gang culture Father Boyle lives and works within, going to jail, addiction issues, and dying young are taken for granted. Our hearts broke at the story of the teen girl who wanted to get pregnant right away so she could experience being a mother before she died. While we found it difficult at times that every success story ended in tragedy, we also felt the stories were still successes because of the accomplishments and changes individuals reached before tragedy struck. We were also impressed with Father Boyle’s unwavering commitment to his life’s work. He is quick to lend a hand, give a ride, or fork over a twenty for any homie who asks. At the same time, he never deviated from his message of non-violence and peaceful resolution. Only Laura had watched the documentary (available at the library) and she reports that it takes place after the book. I’m looking forward to that continuation of the story. We all loved his frank and easy writing style, often funny, and the way he incorporated poetry to help illustrate points. We veered off topic a bit to a broader compassion discussion, and discussed the homelessness problem in Seattle and also our more suburban neighborhoods. Katie’s school has an interesting program for 8th drags, where they spend 3 days living as though homeless. She said it is always interesting to see the personal growth they exhibit, and their different takeaways from the experience. While they didn’t talk about much in the mouthwatering food category, we still managed to piece together one of our epic and delicious feasts. Thanks for the great report and photos Katie! 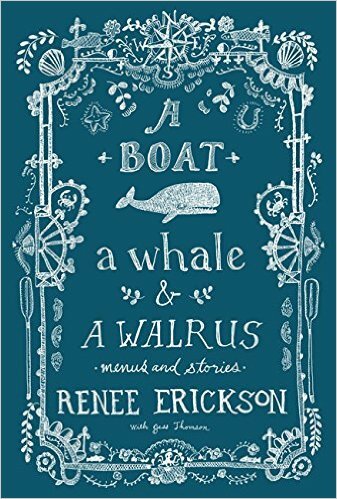 Next month we are doing Seattle restaurateur Renee Erickson's cookbook A Boat, A Whale, and a Walrus. In the meanwhile, you can sample her food at The Whale Wins, Boat Street Café, The Walrus and the Carpenter, or Barnacle. Or her newest endeavors: Bar Melusine and Bateau!